Situated in Bakau this hotel boasts a unique swimming pool with a central bar. The rooms are on the small side and the beach is unsuitable for swimming. There is a man-made sun bathing beach area but unless you are fit enough to climb up and down all the steps that lead to it you won't want to use it too much. Handy for reaching all the bars and restaurants in the Bakau area and local transport is close by, so no expensive taxis. As always, the staff is very friendly and helpful. In the heart of Banjul, not far from the port. This building started life in 1974 and reached its peak during the 1980s as the headquarters of Gambia's National Tourist Office its one of the decently priced good facilities place to live in. The main attractions of this tranquil hotel, known as the 'BB', are the enviable position on Kotu Beach and the quiet atmosphere that can be found around the pool and throughout the well-manicured gardens. A peaceful spot for relaxation is not hard to find. The Hotel is surrounded by a tropical garden, which offers you a wonderful place to relax. This tall town house is on the main drive into town and has been upgraded recently to give the Carlton the edge on its rival hotel a few meters nearer Arch 22. Corinthia Atlantic Hotel located along the hypnotically charming 31mi coastline of The Gambia, just minutes away from the center of the country`s capital Banjul. This superb Hotel property provides endless opportunities for relaxation in the midst of lavishly landscaped gardens or even a temptingly adventurous holiday. We also provide excellent facilities for the corporate traveler. It’s a lively hotel situated beside the sandy beach in brightly colored African settings makes it an excellent place for relaxing and for a beach holiday. Rooms are air-conditioned to give a light and airy feel, enhanced by the large picture windows with either a private balcony or patio from where the gentle lapping sounds of the ocean can be heard. The Laguna Beach Hotel, on the left along the main Banjul highway about 2 miles before Banjul. and formerly known as the Wadner Beach Hotel, is reported to be offering a good standard. 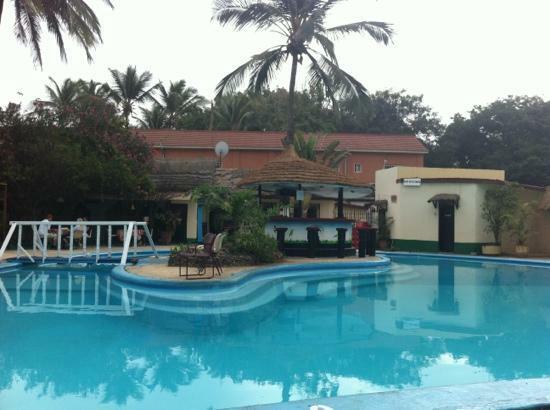 This luxurious Garden Resort is located in the very heart of Cape Point – Bakau, Gambia’s finest Beach District. The tropical Oasis fuses modern African opulence with contemporary elegance and style. Ocean Bay Hotel & Resort an international first class hotel of 5 star rating offers a breathtaking view of the Atlantic Ocean and magnificent Gambia River. Palm Grove Hotel in The Gambia is one of the oldest hotels in this part of Africa, and now completely modernized to European standards offering every modern convenience that the traveler could want, whilst surrounded by an unspoiled country that encapsulates all that is Africa. The Paradise Inn was founded in 1996. At first 5 small type huts were built and later the others, which are substantially wider in diameter. The huts are built in the traditional style of the Fula Tribe. They are typical round huts that offer you the rare combination European comfort in the traditional African style. Each room contains a shower, toilet, sink and is equipped with a double bed and small living room. Your room has outside bamboo seats and table with a superb view over the reserve. The residence is located in a quiet side street of the well known Kairaba Avenue, where you will find Boutiques, Restaurants, Supermarkets and numbers of different possibilities for your shopping expedition.